FAQ: How do you paint signs with stencils? Here is the much requested TUTORIAL on I make my signs using stencils. I use ‘reclaimed’ wood that I buy locally. ANY kind of smooth surface wood will work. After cutting my sign boards ‘to size’, I sand the edges on a 4″ belt sander. The surface is usually already smooth enough, but if it does need some sanding, I use a hand held orbital sander for that. I usually ‘prep’ a whole batch of wood like that; so that when I’m ready to paint, I can just focus on painting. Think ‘assembly line’. I almost always have a stash of ‘ready to stencil’ boards on hand for sign making. That prep work is kinda BORING and when I feel like creating, I don’t feel like having to do the boring part first! BUT, there are also times when I’m NOT feeling creative at ALL, but I still need to use my time wisely and be PRODUCTIVE. That is when I sand and base coat my sign boards. 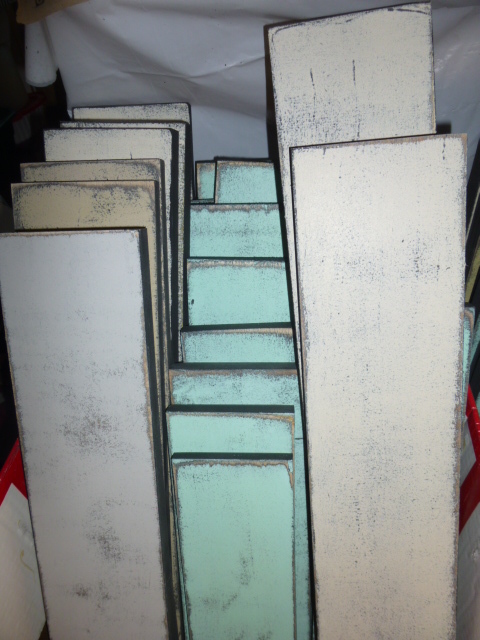 PLUS, I can sand, base coat, topcoat, touch up the edges and distress a good FIFTY sign boards OUTSIDE on a dry day. If I have to do that work inside on my craft table I can get maybe five done at a time! So I really TRY to never have to prep sign boards inside; except maybe for an occasional custom order. I use small foam paint rollers; smoother finish that with a brush. Black paint the edges and front. Let dry. Paint the topcoat color. Let dry. If some of your color has gotten onto the edges; touch up with black paint. This way, when the creative mood hits and I’m ready to stencil on the sign designs, I can get LOTS done in one day. I almost NEVER make one sign at a time. Even custom orders get sandwiched in with more ‘like signs’. It’s just a better use of my time to do several at a time. It takes the same amount of time to set up and clean up, and to clean a stencil after TEN uses as it does after ONE. So, why not use it ten times and save on clean up time?!? 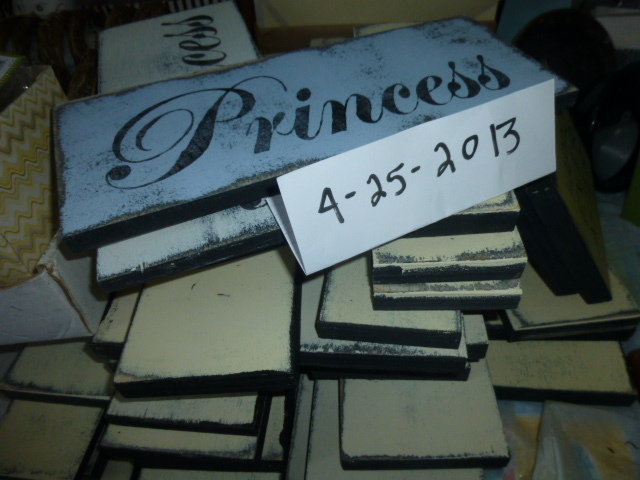 I store my sign stencils in manilla folders. I have WAY too many of them to just put one per file, so I file similar themes together and use paper between them in the folder. BEFORE I start stenciling I set up my sink for cleaning the stencils. The SOONER you get that left over paint on the stencil into soapy water, the easier it will be to clean. I’ve found that DAWN dish soap works best. I put a couple of squirts into a dish pan and fill about half way with warm water. As you can see from the above stencil, not ALL of the paint always comes off. And some people will tell you that you don’t need to clean the paint off at all. But if you want to get more than 10 uses out of a stencil, you’d best clean off some of that left over paint! If it builds up enough you will no longer have a ‘sharp’ (as in PRECISE!) edge to your stencils and your lettering will be sloppy. These are the kinds of ‘pouncers’ that ‘they‘ tell you to use. THEY are wrong! These do not work very well at all. And trust me, I’ve made THOUSANDS of signs, and I KNOW what works best! These sponge or soft rubber pouncers just fall apart after a couple of uses, and they don’t give you a very sharp line at all. I used to spend HOURS touching up the messy edges of my lettering before I happened upon the BEST applicators ever! YEP!!! 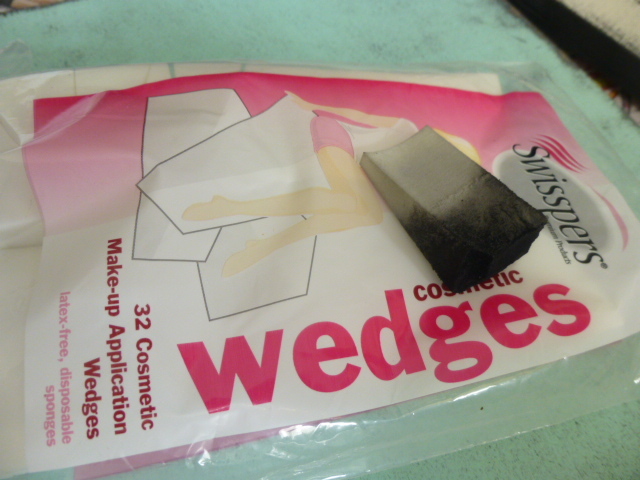 Cosmetic make up wedges! These work like a dream, and are much easier to hold onto and my hand doesn’t get all cramped up when I am making a lot of signs. *CLEANING YOUR PAINTING SPONGE AFTER USE: I actually don’t bother cleaning mine. I just wrap in a plastic baggie and store in a sealed plastic container. 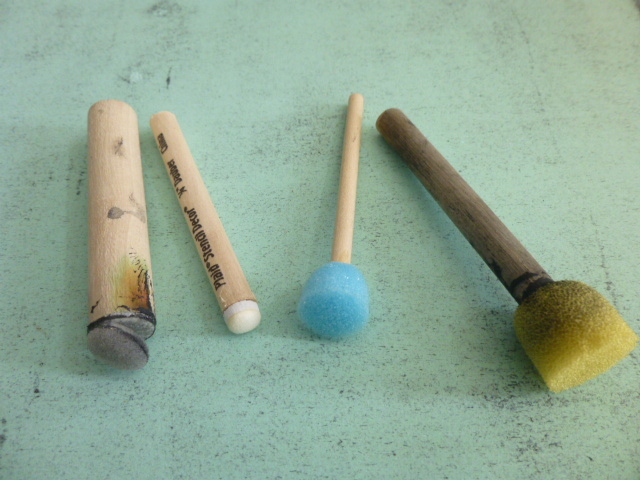 They don’t stay as “moist and ready for re-use” as the brushes and rollers that I save for re-use in a similar way, as shown here. But it still saves a lot of water otherwise wasted for cleaning such a small item. Besides, I usually make SO MANY signs at a time, that I practically wear them out in one use! Still I save them. If the paint has dried out on the end, I can usually just trim off the dry crusty part and get another use or two out of that same sponge again. I use a scrap piece of cardboard for my ‘paint palette’. Squirt out a blob of the black paint and VERY LIGHTLY dab the wide end of your sponge into the paint; just enough to get a little bit of paint. Then you POUNCE your sponge around on a dry area of your palette to work the paint down into the sponge. You want it to be ‘moist’ with the paint, but not WET. Using blue painters tape, tape your stencil into place, then POUNCE your paint loaded sponge over the open parts of your stencil. DON’T RUB it. POUNCE it. Quick, short dabbing motions until it’s fully covered with paint. You WILL need to re-load your sponge with paint often. DO NOT try to speed up the process by using more paint on your sponge. All that does is make your edges BLEED. This is what your lettering will look like if you have too much paint on your sponge (or are using the wrong kind of applicator). The edges will BLEED and be sloppy. So, yes it takes longer to use a very lightly paint loaded sponge; but you get a better product! THIS is how you want your lines to look! When you are completely done stenciling your design on your board, immediately take your stencil and submerge it into your pan of soapy water. I let mine soak for a few minutes. Then lay the stencil flat in the sink, put a drop of Dawn dish soap onto a kitchen scrubber and GENTLY scrub the paint residue off your stencil. As I already said, not ALL of it comes off. And DO be careful to not ‘snag’ the pointy parts of your stencil with your scrubber. I lay my washed stencils on a towel to dry. I kind of got ahead of myself a bit there. FIRST, right after you remove your stencil, your lettering will have ‘gaps’ in it. That is just the nature of a stencil. For example, they can’t completely cut out the middle of the letter “O”, so they leave little ‘tabs’ to hold the center in place. PLease, PLEASE, PLEEEEASE never leave your signs looking like this with the ‘tab gaps’ showing. It’s very quick and easy to fill them in! Use a very fine paint brush with just a tiny bit of paint on it and ‘connect the lines’. Be sure the lettering is dry before you do this so you don’t smear your paint. And you might need to thin your paint a little for this process. But only thin ‘a dot’ of paint on your palette. NEVER add water to the bottle! On some signs, you can barely notice the gaps (top sign); but still, please take ONE minute to fill them in. It looks SO much more professional with them filled it. I literally CRINGE when I see a sign made from a stencil with the gaps showing!! And with a little bit of practice, you’ll be able to stencil HUGE signs like this! I actually did FIVE of these signs in one ‘sitting’! 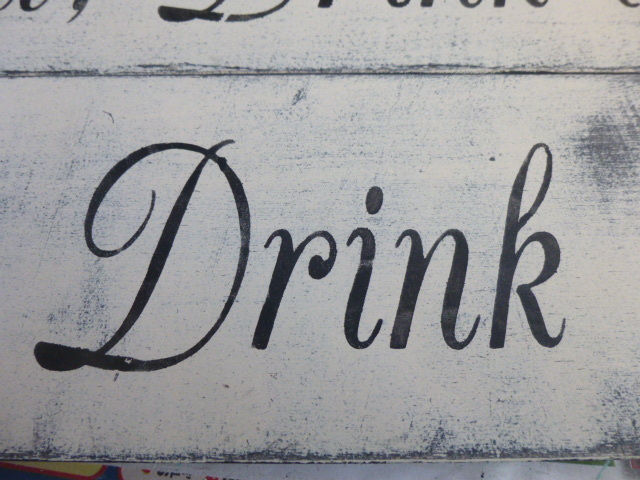 Do add a coat of varnish to your finished sign. I prefer MATTE (NO SHINE) but it can be hard to find. I just had to spend $56.00 on a GALLON of matte varnish because they were out of quarts and are discontinuing it altogether at the paint store! sigh. I buy my stencils from several different places on-line. MOST of them have the very same stencils and pretty much the same price ranges, so it doesn’t much matter who you buy from. Be prepared for a bit of ‘sticker shock’! Stencils are NOT cheap; and probably not really worth buying if you are only going to use them ONE time. I Most of the stencil supply companies have ‘% off sales’ throughout the year; I try to wait for those sales to stock up on new stencil designs. Thank you! I wholeheartedly enjoyed this post. Your signs are beautiful. AJ, thank you so much! I always learn so much from you! You are very generous with your techniques and wisdom. Thank you so much for sharing your experience. Well Done!! Thanks Again. Thank you for the helpful tips based on your experience! My daughter is getting married in September and I am planning to make some signs for them. It will be a casual outdoor country wedding. I am sure you have saved me a great deal of “trial and error”!!! Where do you buy stencils? Not able to find any in local stores maybe a website? Thanks for the link for the stencils! Could you please email me with the preparing process? Thanks so much! After following the link you added..I wanted to share with you and your readers that a much cheaper place to buy is thestencilsmith.com. Free shipping also. My order was shipped within two days! I’ll second thestencilsmith.com. They have a large selection and are great to deal with. I have cut vinyl stencils for some personalized gifts but you’ve inspired me to get back to using my stencil stash. Thanks. I enjoyed your post. 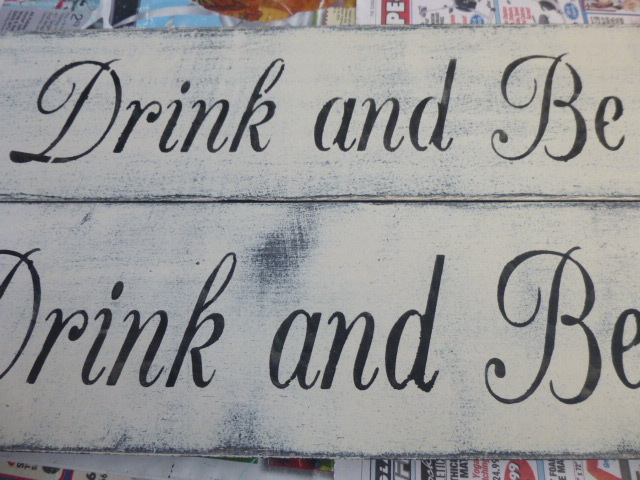 im really intrested in how you paint your signs and distress them..
ive done a few…do you stain the wood first? and then a coat of color and then do another coat of a different color and then sand to distress? ALL of that information is in the two posts combined. click on the link to see the other post. Michael procures the reclaimed wood for me AND cuts it to a few ‘standard sizes’ (my most used sizes) then I cut it ‘to the exact size’ if needed. (I pay him for his labor). I cannot tell you EXACTLY where he gets it from as that is a carefully guarded secret. Besides, unless you lived where we do, that information would be of no help to you AT ALL. Just about ANY place that uses wood is going to have scraps that they throw away. JUST ASK! Michael always asks permission to ‘dumpster dive’. And yes, you might actually have to climb into a dumpster to get the wood. (which is why I ‘let’ HIM do it for me!!) 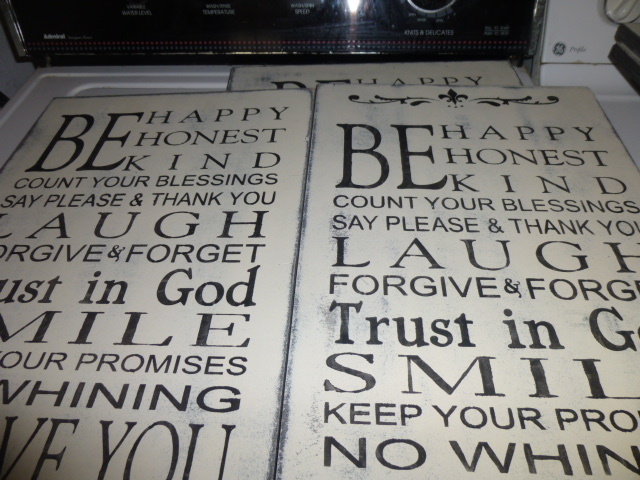 And yes, the signs with whole sentences and longer sayings are a single stencil. Would be far too labor intensive to spell those out ‘one letter at a time’! (and nearly IMpossible to get each letter lined up perfectly!) 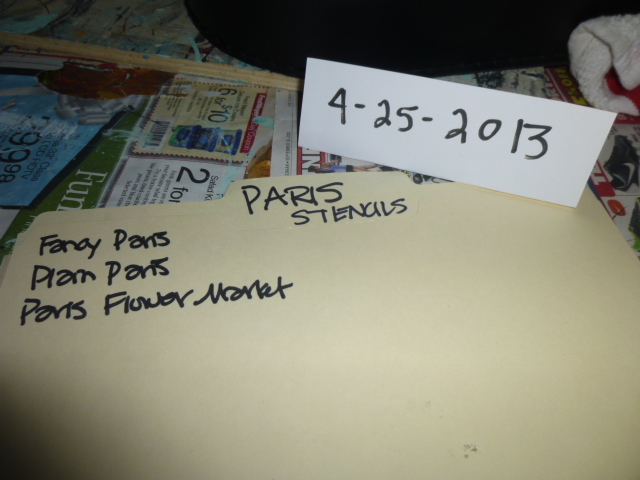 I do share my sources for buying stencils on my blog. Use the search box to find those posts. Whatever kind I can get for CHEAP!! Most often reclaimed birch plywood. I wonder if I can use a MATTE Modge Podge for the sealant? what are your thoughts? It’s cheaper. I am not familiar enough with mod podge to recommend it. Where do you purchase your stencils? You can find that information by doing a search on my blog. Your step by step instructions are wonderful! I’ll definitely try the make-up sponge trick on my next stencil. Besides painters tape, are there any other temporary adhesives to use that would help the stencil to not move during the “pouncing”? I find those small tabs raise up and down creating messy lettering. Thanks for your helpful tips! I usually just tape the corners of my stencils, and they stay in place just fine. I think you will lost that ‘stickiness’ when you start using the make-up sponges. Just be sure you ‘dab out’ as much paint wetness as possible before you start pouncing. Your sponge should almost be DRY to the touch. Too much paint is what causes the paint to ‘bleed’ around the edges. Best of luck! Thank you so much for sharing your detailed instructions! Your signs are beautiful! How do you make you stencils? I buy all my stencils from others. Appreciate your ideas to speed up mass production. How do you distress you boards? Linda, If you click on the referenced ‘other post’ mentioned, you will find the answer to this question there. Read the other blog post referenced in this one for the additional info on sign making. Do you have a post on prepping your signs before you stencil? This was the best tutorial ever! New at this, suggestion if I only have one letter and need it again for same word? Just clean and DRY your stencil before you use it for the second letter. Love your work. You’ve inspired me to make a few signs. Excellent turtorial. I am so excited to hear about the make sponges, it makes so much sense. Thank you for sharing! The craft industry has finally caught on too! I saw a little package of them in Joann’s today with the other paint applicators. The ones at Dollar Tree work great for me. Just avoid them if they are too ‘soft and smooshy’. You want ones that ‘bounce back’ when squeezed. Love the signs, and was wondering where you get the stencils from? I’m just getting back into making signs again and happened to stumble upon your blog. Thank you so much for all the wonderful information you shared. I definitely learned a few things as I was reading through. I have always used the makeup wedges too. It’s a great tip and they just work so much better! However, I’ve found that when using the painters tape, the letters were still lifting up causing the paint to seep under the stencil, so I went back to using stencil adhesive. But I guess that would be and individual choice. I was wondering how many coats of the basecoat and topcoat colors you apply before distressing the wood? Hi Michelle, The number of coats of paint required TOTALLY depends upon how much pigment your paint contains and HOW you apply it, AND the desired final result. Buy GOOD paint (NEVER the cheap-o craft paint!) Good paint applied with a foam paint roller (which is what I use) will cover well enough in ONE coat. 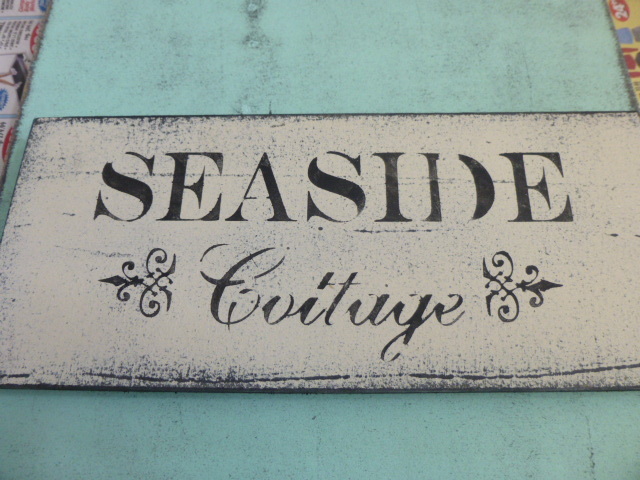 BUT, I also sand/distress my painted signs before I letter them and WANT some of the base-coat and even wood to show through; so more paint coats would just mean more sanding to achieve my desired look. P.S. Your paint ‘bleeding’ problem could be from paint that is not THICK enough, or too much on your applicator sponge. I still occasionally get bleeding if I’m am over zealous in paint loading my sponge. Hi Aj, Thank you for your reply. I typically use Folk Art acrylic paint, but recently wanted to use up some Milk Paint I had. I’m guessing it was probably too thin. I have another question for you. 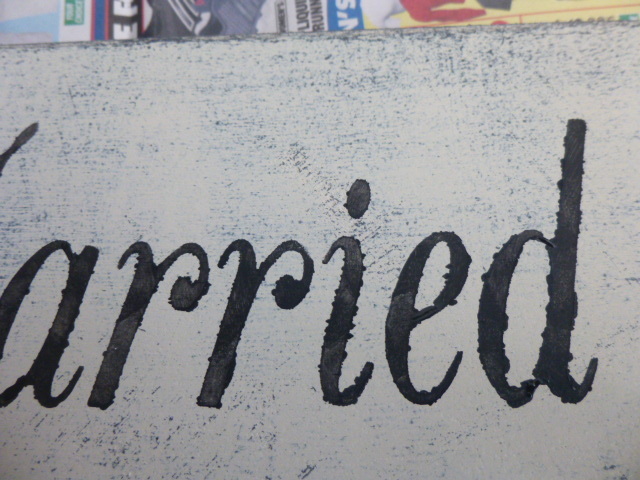 Can you share what grit # you use when sanding/distressing your signs? I always use COARSE grit sandpaper. Hi – thank you so much for this awesome tutorial! Painting wood boxes – similar to signs for personal use. Two questions if you don’t mind. 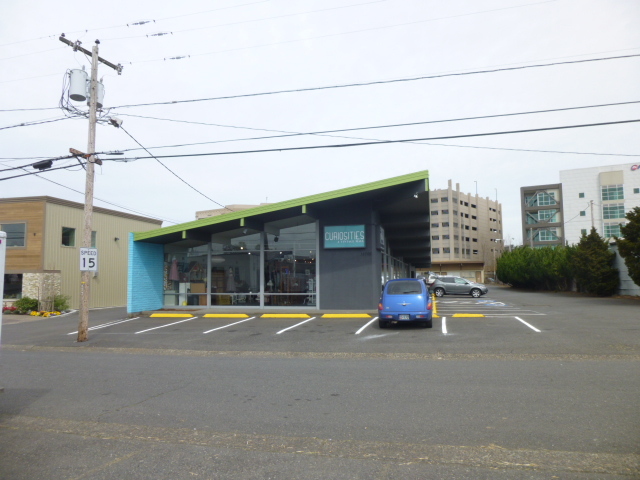 1. you commented to one question – to use good paint – never cheap craft paint. What do you suggest – I thought you recommend Folk art paint. Is that a good paint? and…2, what type of sealant do you use for outdoor use. Everything I have tried yellows and looks horrible when dry. Do you spray or paint it on? Thank you!!!!!!!! Sandy, YES, Folk Art brand IS a very good paint. 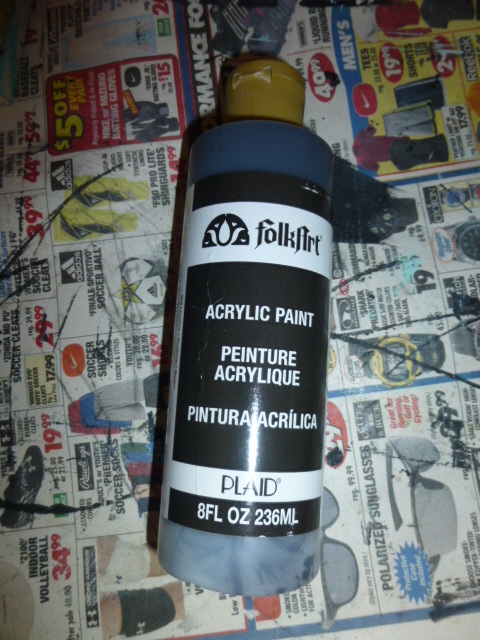 The ONLY paint I use for ‘lettering’ my signs. My signs are for indoor use only, so I cannot recommend a weatherproof varnish; sorry. Because of the volume of signs that I make, spray on varnish is cost prohibitive. I use a brush on matte varnish; which I buy ‘by the GALLON’! I have to say, i spend a great deal of time reading and learning about techniques others use in crafted work… Your methods and instructions are amazing such complete directions.Very well done… I do have question ( I likely missed the answer) how do you stress your wood? I do the distressing on my signs with an orbital sander; which is also what I use on most of the furniture I make over. On smaller areas that the sander won’t fit into, I sand by hand . . . and I always use COARSE sand paper. Thank you for the tutorials, I love your signs! Hi AJ, as others have posted before me, I want to say thank you for an amazing post! The description was very informative to me since I am just starting. I do want to ask you, is this a business for you or a hobby, and if it is a business have you succeeded?? Just something I am looking at for myself what the high and low points are. Hi Joann, Is this a business or a hobby for me? For me, it is just a hobby. Initially I TRIED to build it into a profitable business. However, due to several physical limitations, that proved to be an impossibility for me. That does not mean that a similar business model for someone more ‘able bodied’ than myself could not become profitable. As a business, have I succeeded? I guess I already answered that question above,because I was NOT able to build my hobby into a profitable business. Still, I do not by any means consider this ‘venture’ a failure of any kind. Without my hobby I would have nothing to keep me occupied and probably just sit around and feel sorry for myself. It serves a very valuable purpose in my life. Perhaps not the purpose I had initially HOPED it would, but even WITH the many obstacles I have to contend with in this life, God has allowed me to build something that I can be proud of. AND provided for my needs . . . and given me enough to share with others. You CAN’T ‘fix’ it when paint bleeds under your stencil. That is why I go into such detail regarding AVOIDING the paint bleed. The only thing you can really do to salvage the sign is to sand off your lettering; repaint and re-stencil. Thanks for the tip!! I’ll give it a try. Thank you for such a good tutorial! I have a non profit animal rescue & would like to make signs on pallet wood & sell.. We have a small spot at our vets office to sell items … So I’m going to give it a whirl!! How do I know how to space my letters? Kathy, Best of luck in your new sign making venture. As for ‘spacing the letters’ on signs; it’s not a concern with the kinds of stencils I use. 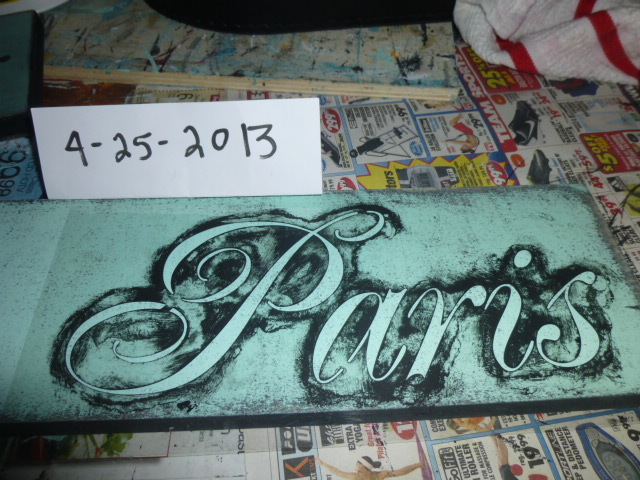 If you look back at my blog post, you will see the ‘Paris’ stencil I used for the example sign. Basically I have an individual stencil for every sign i Make. I only have ONE set of the complete alphabet stencils for making custom worded signs. Spacing takes time and patience; and clear or opaque stencils help a LOT. My alphabet stencils are clear so I can SEE how far to space the letters. I literally THREW AWAY all the alphabet stencils I had bought at craft supply stores over the years BECAUSE I could not SEE the previous letters I had painted; due to them being made of plastic that you cannot see through. Buying ready made stencils for every sign I make HAS been very expensive. But I can create better signs, and do it faster with them; so I considered it an investment. You can find my stencils resources in my blog. Use the search box and look for the words ‘buy stencils’. I taught painting, of all sorts, for 28 years. Your tutorial is great, and very thorough. The only thing I do differently is clean stencils in alcohol. The paint just slides off, no scrubbing or taking a chance on tearing stencils. Do love Dawn tho and use it for many other things. Do you create signs to sell? Thanks so much for sharing with us. So generous and kind. Will use many of your tips. 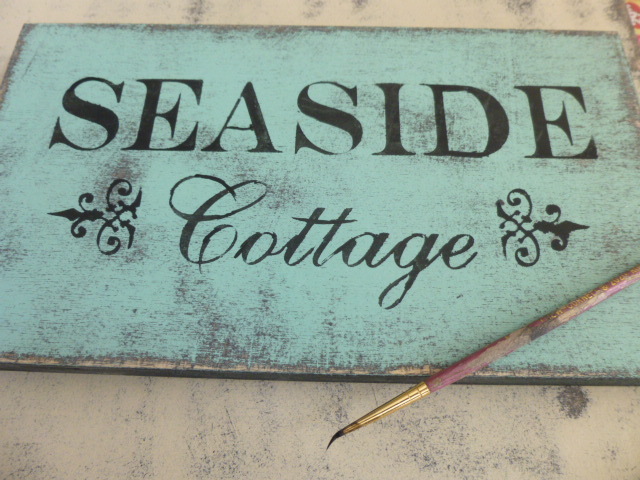 Do you paint personalized signs? If so, how can I get in touch with you? Love your work. Is there a particular type of wood that you prefer for your signs? ANY kind of wood CAN be used for making signs. But of course different wood will hold paint differently, and sand and distress differently. I use reclaimed Birch plywood because it’s what I can get at the best price. Thanks for the info. Very clear and easy to follow. Reading comments I see you say you’re not not in business, this is just a hobby. Not all profits are money. And we are profiting from your kind gift of knowledge. I too love passing my knowledge. Way more value that money. Where did u buy the “BULK OF STENCILS” from? Great info. I really enjoyed reading this. Feel like I’ve learned a lot. Thx so much for sharing. ANY kind of wood COULD really be used. I use plywood only because it is what I can get at the best price. Absolutely loved this, you helped me so much!! Thank you!! This has been the most helpful thing I have ready on stencils. You would think finding something about how to stencil would be easy. Everything is complicated and finding stencils is even worse. So,Thank you so much! Thank you so much. I REALLY appreciate all you’ve shared. I’m just starting to play around with sign making just for my own decorating and find it to be quite daunting at times. I’m not naturally crafty so it takes quite a bit of work and effort. This is suppose to be fun, right? So when i can tap into others experience it is invaluable to me!! Thank you for loving what you do enough to share it with “the world” I’m learning so much and learning to enjoy the process! Blessings!! Just started stenciling and I could have not done a great job without your tips!!!!! Thank you for knowledge !! Yep that is how i do mine to however i have never filled in the blanks, i think ill start. Curious what type wood you use? Most people don’t bother filling in the gaps that the stencils leave on the letters. The signs look more more professional though if you do. I use reclaimed birch plywood, because it is what I happen to have the best access to. ANY kind of smooth finish wood will work though. After I’ve used the stencil I’m having a hard time getting the colors to match up when I fill in my stencil gaps. The dry brush is matching the fine touch up lines. Any suggestions on how to fix this? I don’t really understand how the colors don’t match if you are using the exact same paint for lettering and touching up, as I have shown in my tutorial?? Sorry I can’t be of any help. A friend of mine is tearing down their barn built about 1900, and she is letting me take what I want. I am making trips to pick up boards every couple weeks. Thanks for the great tutorial. I appreciate you sharing your expertise with us beginners. Thank you for this. Very informative and detailed. And when you said very confidently, “I know what Im doing”, about not using stencil brushes. I said to myself she sure does so I gave mine to my kids. I have over 100 pieces of barnwood planks from the 50’s that I got from helping our local bookstore clean up and distmantle book shelves so Ive got plenty of signs and things to make! I typically use 1/2″ thick boards, but the depth of the wood doesn’t really matter; well, except that thicker wood will be heavier and more costly to ship if you are mailing your signs. I pretty much use whatever I can get cheaply! wood is sized to fit the stencils . . . dozens of different sizes from small to extra large! I use fence replacement boards that I buy for less than $2.00 at Lowe’s. They can be cut easily and are a great width. Thank you. I’ve researched lots on this topic. I remember your instructions. Your knowledge shows through, and you dos and dont’s are absolutely true. Much appreciated. What an excellent tutorial! I’ve been painting signs for years and now…well you just helped make my work easier! Thank you! What is that color blue/green your using? Is that a Ben Moore or Sherwin Williams color?? Your signs are beautiful btw and I really enjoyed your post!! Thanks! I mix all my own paint colors. No exact formula. I just ‘eyeball’ it. What do you use for your basecoat? As is noted in the blog post, black paint. Thank you for taking the time to run through your process. And the advice. Great help!! How do you keep your stencil in place while applying the paint?